The Stiga MultiMate takes the hard work out of those fiddly gardening jobs like edging, pruning and hedging by being battery powered. This 10.8v SGM102AE is the big brother to the SGM72AE. 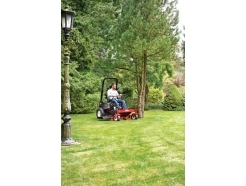 The Stiga SGM 102 AE Multi mate comes complete with a 10cm grass blade and 18cm hedge / shrub cutting blade. The unit is powered by a 10.8V 2.5Ah battery and can run for up to 110 minutes depending on the cutting conditions. Stiga estimate an approx working time of up to 75 minutes when the multimate is used with the grass blade. The 10 cm grass blade is perfect for trimming stray blades or patches of grass and around obstacles like posts or garden furniture legs. The 18cm shrub or hedging blade can be used for light trimming of domestic hedges and shrubs with its 8mm cutting capacity. Each blade can be changed quickly and easily thanks to the tool free click system. For added comfort and convenience the handle can be rotated 180 degrees into 3 positions. Stiga have also included a textile bag to keep everything in so you don't lose anything. A range of other optional extra accessories are available for the SGM 102AE including a soil grubber, pruning disc, 8 and 13cm grass blades, 20cm shrub blade and telescopic handle. The battery powered Multimate tools are very useful for gardeners who have movement or strength restrictions in their hands.